Every state has a “Report Card” system that provides information on student performance, demographics, attendance rates and other related data regarding public schools. Most state systems, including Kansas, use labels like ‘approaching standard’ or ‘Level 1’ that make it difficult for parents to understand how a particular building is performing. At least 18 states (be it through legislative or executive action), however, use labels that everyone understands – A, B, C, D and F. An A-F grading scale is a necessary and intuitive method that provides clarity and transparency to present an overall picture of how a school is doing. It also affords an opportunity for case studies that compare both similar and dissimilar schools; studies that help answer questions of why some schools do well and others do not. Kansas Policy Institute developed this A-F system for citizens and policy makers to facilitate better understanding of the academic challenges to be overcome, recognize public schools that show annual academic achievement gains, and hopefully identify ideas from the improving schools that can be replicated across the state. Funding amounts down to the school building level are not yet available, but due to requirements of the new federal education law, the Every Students Succeed Act (ESSA), districts will soon be mandated to provide that information. That is an important development because Kansas has formula-based funding and “A-F Grading for Kansas Schools” will show that some schools outperform other schools regardless of funding levels and/or specific student population characteristics. 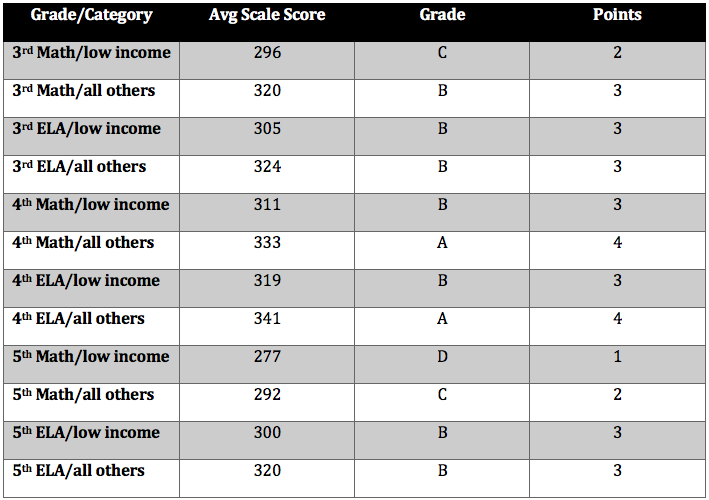 The “A-F Grading for Kansas Schools” uses state assessment data generated by the Kansas Assessment Program (KAP) under the operation of the Kansas State Department of Education (KSDE) and assigns an overall school letter grade much like a student report card; equal weighting is applied to a series of individual grades to calculate a Grade Point Average. 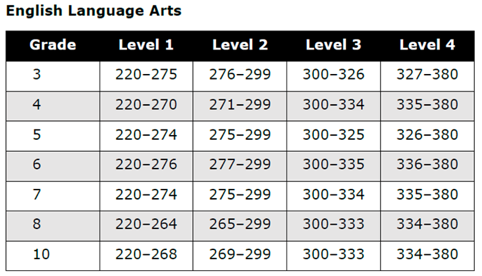 Each grade level tested by KSDE (grades 3-8 and 10) is assigned a grade for English language arts (ELA) and math for low income kids and those who aren’t low income, so each grade tested earns four letter grades. See the Methodology section below for additional information. It should be noted that school size in Kansas varies greatly, and those schools with small student populations can experience significant swings in performance from year to year. That notwithstanding, the fundamental exercise is still appropriate for all schools. A total of 1,268 public schools received grades for 2018; a few schools had to be excluded because of data limitations related to privacy issues. The distribution is reflected in the adjacent table. Only 5 high schools earned a “B” this year for 10th-grade results: USD 112 Central Plains, USD 269 Palco, USD 275 Winona, USD 323 Rock Creek and USD 500 Sumner Academy in Kansas City, Kansas. There are large and persistent achievement gaps for low income students in Kansas, as well as in all other states, and there is also wide variance in the percentage of low income students across individual buildings and districts. For these reasons, a grade based on all students would produce misleading results. Here’s an example. Let’s say the low income kids account for 20% of the students in Building 1; their average score is 60 and the average score for other students is 80. The kids in Building 2 get the same scores but half the building is low income kids. Building 1 would have an average of 76 and Building 2 would get a 70, even though the student groups had the same scores. Assigning a grade based on average performance of all students would also allow a building to appear to be getting better even if the low income kids aren’t improving or doing worse. It’s not that low income students aren’t capable of learning that causes achievement gaps, but that they haven’t had equal access to educational opportunities. Those who don’t get a good education have a much more difficult time finding employment and are more likely to engage with the judicial system and need social services. The economic vitality of communities is largely related to the academic achievement and education attainment of its workforce, so it’s imperative that this large segment of students is highlighted and addressed. The proxy for low income is qualification for free or reduced lunch pursuant to United States Department of Agriculture rules. The school funding formula provides close to $500 million additional support each year specifically to reduce income-based achievement gaps, providing another reason to monitor those students’ progress. Every spring, students statewide in grades 3 through 8 and grade 10 are tested in the subjects of math and English language arts (ELA). The results of those tests are reported on the Kansas State Department of Education (KSDE) website. Students earn a score in each subject ranging from 220 to 380. KSDE has developed a “cut score” system for translating those scores into four performance categories. Cut scores vary by grade level and are different for math and ELA but they do not vary from year to year. 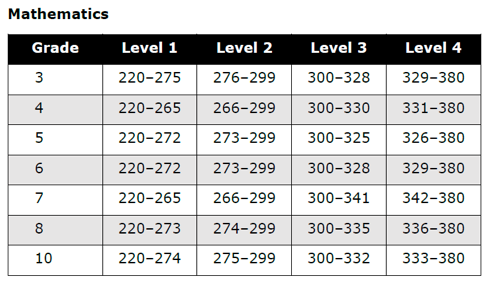 These tables show how KSDE distributed scores starting in 2015, followed by the description for each level. Level 1 indicates a student is performing below grade level and needs remedial academic attention. Level 2 indicates a student is performing at grade level with basic understanding but needs to attain a higher skill level for college/career readiness. Level 3 indicates a student is performing at grade level with effective understanding and is on track to be college/career ready. Level 4 indicates a student is performing at grade level with excellent understanding and is on track to be college/career ready. KSDE has defined “college/career ready” as any student scoring in Level 3 or Level 4, according to the approved consolidated state education plan submitted to the U.S. Department of Education pursuant to the federal ESSA. Enrollment numbers are those defined and reported as “Headcount” enrollment by KSDE as of November 2017. This number is commonly known as the number of students in attendance on September 20. Subsequent adjustments to enrollment are made pursuant to Article 51 72-5132(m) of Kansas Revised statutes. Low income is defined as those students who qualify for free or reduced lunch pursuant to the United State Department of Agriculture’s school lunch program. Those figures are reported by KSDE at the Data Central report generator and the same data is used in this analysis. By state statute those students who qualify for free lunch generate at-risk dollars given to the schools as part of their total state funding. Some schools and/or student population subgroup assessment data may not be available due to student privacy rules set forth by KSDE. Any group or subgroup with a population less than 10 is not reported by KSDE. The Claire and Glenn Swogger School Improvement Award is offered in conjunction with Kansas Policy Institute to recognize Kansas public schools that show annual academic achievement gains. Glenn Swogger and his late-wife Claire always believed that a strong academic foundation is the best way to help children succeed and have communities flourish. Kansas is facing serious academic challenges. While funding continues to set records and is far above long term inflation, less than 30 percent of high school students are on track for college or career and large achievement gaps persist for low-income students. Simply spending more money hasn’t – and won’t – make a difference, but identifying buildings that are improving could produce ideas that can be replicated across the state and improve public education. Click here to download a PDF of the Swogger Award recipients.